Transparency Market Research has launched a research report titled “Water Soluble Polymers Market - Global Industry Analysis, Size, Share, Growth, Trends and Forecast 2013 - 2019.” The report offers users a clear perspective on the market to help them create the most feasible market strategy.According to the report, the major growth driver of the global water soluble polymers market is its increasing base of applications in water treatment. Growing concerns over the quality of water have led to greater efforts being taken in terms of water treatment, which is enforced by environmental regulations. The global water soluble polymers market finds use in water treatment for urban as well as industrial water. The global water soluble polymers market was previously worth US$23.38 billion in 2012. Experts say that the market is estimated to grow at a CAGR of 5.9% from 2013 to 2019 to reach a value of US$29.63 billion by the end of 2019. Its 2012 market volume was 5,483.8 kilo tons. The report divides the raw materials used in the global water soluble polymers market into three segments of natural, synthetic, and semi-synthetic. 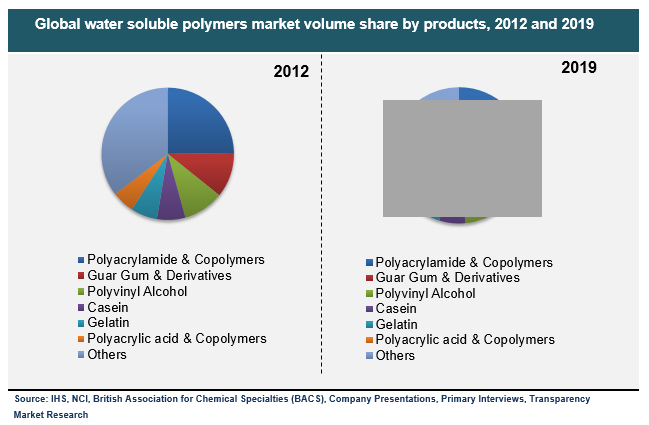 Further research reveals that the dominant segment of the market was synthetic water soluble polymers, which held nearly 60% share of the global water soluble polymers market.The other 40% of market shares were collectively held by natural and semi-synthetic segments, in terms of volume.The top polymers that are commonly used include polyacrylic acid, gelatin, casein, polyvinyl alcohol, guar gum, and polyacrylamide. Other polymers include quarternary ammonium compounds, polyamines, PEG, PVP, and polysaccharides. The report states that the largest product in the global water soluble polymers market in previous periods was polyacrylamide. It is also expected to be the fastest growing segment, marking a 7.4% CAGR from 2013 to 2019.The largest end user for the global water soluble polymers market in 2012 was water treatment. At the time, the segment held 23.7% of the market’s share in terms of volume generated. Water soluble polymers are often used to reduce friction in fluids and as a wastewater treatment agent in the petroleum industry.The report explains other growth drivers including increasing extraction processes of petroleum and shale gas around the world. The top companies in the global water soluble polymers market that are discussed in the report include BASF SE, Kuraray, Kemira, Ashland Inc., and SNF. More than 70% of the global market is dominated by the top three contenders.The report’s geographic segmentation reveals Asia Pacific to be the dominant region in the global water soluble polymers market, followed by Europe. Nearly 31% of the market share was held collectively by North America and the Rest of the World region. Asia Pacific is expected to maintain its dominant position, growing at the fastest pace in the report’s time frame.